George Alexandrou, international reporter, writer, and political commentator, on his thousand-page book in Greek, He Raised the Cross on the Ice, exploring the sources, traditions, routes and cultures of St. Andrew’s apostolate. GEORGE: People journeyed over vast areas in antiquity and we know quite a lot about their travels. For instance, Claudius Ptolemy drew a map of the ancient world in the second century after Christ (and this is a real map of the world as we know it today). 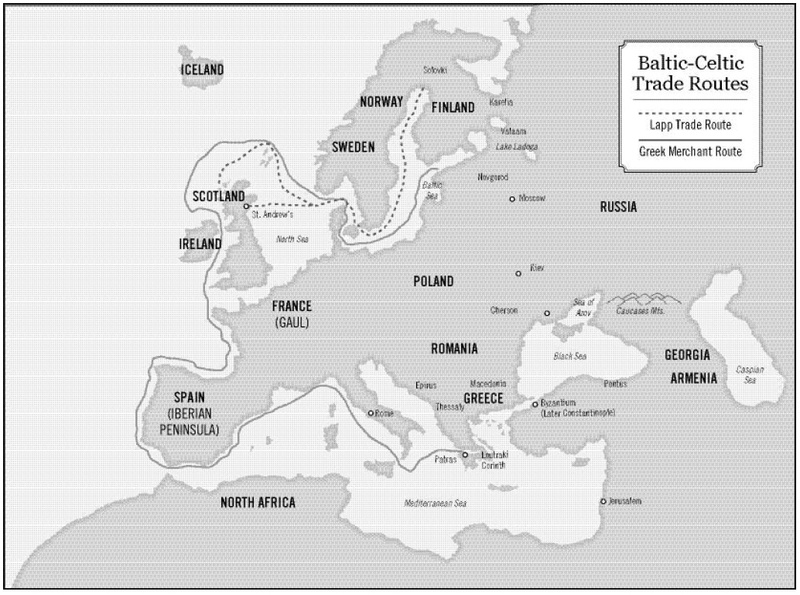 From Ptolemy and other Hellenistic geographers and historians we know that there were extensive trade routes such as the Silk Road, the Cinnamon Road, the Spice Road, the Golden Road from the Kingdom of Zimbabwe to the Mediterranean Sea, and the Amber Road from the Baltic Sea to Rome, through Denmark and the British Isles. The Verangian Road (as it was called by the Byzantines) was traveled by Herodotus 1,400 years ago, and went from the Crimea through Kiev, straight to Valaamo and the Baltic Sea. Centuries earlier it was called the Dneper Road. There was another major route connecting the Mediterranean to Cornwall in the British Isles, the Tin or Pewter Road. Then we had the famous Silk Route, which united the Chinese Han Empire with Rome. There was also a trade route along the Nile between Meroe and Axum, the kingdoms of Sudan and Ethiopia. The Cinnamon Road connected Shanghai in China with Indonesia and Borneo, through Java to Tanzania. The Spice Road united China through Burma, Sri Lanka and present-day Pakistan to the Red Sea. You can imagine, these were all important routes and a simple, unostentatious man like St. Andrew could take any of them easily. RTE: Were the ancient and classical maps more accurate than later medieval maps in the West? GEORGE: Yes, later Christians would say, “Paradise was here, the earth was flat, etc.,” but if you look at the old Greek maps, they not only knew the earth was round, but the longitudes and latitudes are the same on their maps as we know them today. They are not exactly the same because we count ours from Greenwich and they didn’t, but you can correlate them precisely. You can even find America and Australia on some maps (i.e. the map of Crates the Maleot in 150 B.C.). This is why I believe we can accurately locate these places from the old traditions. When barbaric peoples invaded the older Christian civilizations and became Christian themselves, this was right spiritually, but it was a catastrophe for civilization. Night fell on education and learning, although spiritually and culturally it was a dawn for the barbarians. It was their time, for the first time in history. RTE: Although there were dangers from bandits and smugglers, there probably weren’t the kind of border controls we have now. GEORGE: Yes, but even now there are dangers. Going to Siberia isn’t any safer now than it was 2,000 years ago, but there was often another attitude towards travelers then. Although there were always dangers, in many ancient cultures a traveler was sacred, he was from far away and people didn’t want to despoil him; they wanted to hear about his country and his civilization. You didn’t need visas, documents, you were not even in need of friends because you were a special person, a traveler. You were coming with far-off ideas, different beliefs, strange dress. You were more often a person to admire than someone to fight or to steal from. In the ancient world pass- ing travelers were laden with gifts – this was Marco Polo’s experience. Those were different times. With my own decades of traveling to difficult and exotic places, it is easy for me to understand how St. Andrew could have traveled as extensively as the traditions recount. RTE: When we first spoke about your research you made the remark that when the Lord told the apostles to preach the gospel to the ends of the earth, they did not think this meant their descendants. They took this literally. GEORGE: Yes, we have many written traditions from the second and third centuries A.D. that the apostles went to Middle Asia, to sub-Saharan Africa, to India, even to old Burma. They went to the land of Sogdiana, which is modern Uzbekistan/western China… we had all these memories and traditions of the first years of Christianity, but we thought they were just strange tales. Now, with the help of archeology, we understand that these roads did exist, and that many, many people took them. We know, for example, that the Indonesians were traveling from Java to Tanzania across the Indian ocean. They had large, well-balanced outrigger canoes, and they would load them with their families, livestock, food and water, and set out from Java – sometimes traveling for a lifetime. This is how they discovered Madagascar. They sailed the open oceans without any fear. The Celts also were extensive travelers in the North Atlantic with their leather-covered boats, the curraghs. Another example of widespread travel is that in 330 B.C., Pithias knew northern Europe well. He had been to Cornwall, to Scotland, to Thule (some say that ancient Thule was Iceland, others Greenland, others Northern Scandinavia) and from there he traveled to Marseilles in forty-five days. GEORGE: Yes. And in Claudius Ptolemy’s (100-170 A.D.) geography we have Diogenes – a second Diogenes, not the philosopher – who, during the apostolic times, left by ship from Alexandria and went to Azania, present-day Tanzania, to a place called Rapta. From Tanzania he walked for twenty-five days to the mountains of Ruvenzori between Lake Albert and Lake Edward in what is now Rwanda, Uganda, Congo-Zaire. You see, it was a small world at that time, and the Greeks already knew the source of the Nile. So, when the Lord told the apostles to go to the ends of the earth, the Greco-Roman knowledge of the world at that time was quite specific. They knew where the ends of the earth were. For the ancient Greeks and Romans, the world ended in an abyss, the “Antipodes,” after the Prasum Promentory in Zimbabwe. However, the ancient Israelites, the Himyarite Arabs, Phoenicians, and Nabbataean Arabs knew that this was not the final abyss, but the dzimba dza mabwe, possibly the mines of King Solomon, or the Bantu Empire of Monomotapa (Mwene Muntapa). My point is that, geographically, Ptolmey gave us all the known places and no one can say that this is rubbish. China, Indonesia, Lapland, Britain, Scandinavia were all known. It was not easy to go to the ends of the earth, but it was possible. In his epistles, St. Paul speaks of being obliged to spread the gospel or he will be lost. In Greek, these words, “to the ends of the earth” are very precise, they are in no sense allegorical and the apostles would have understood this literally. The ancient geographers used this phrase as a precise geographical definition. That the apostles accomplished this to some degree is borne out by the Church historian Tertullian, who wrote in 170 A.D.: “We have deacons, we have priests and we have churches, to the ends of the earth.” Then he describes the places: the Sarmatians, Sub-Saharan Africa, the British Isles, and the Scythians. The territory of the Sarmatians, for instance, stretched from the Caspian Sea to Lake Baikal; and from Mongolia to Siberia. RTE: How did you begin to write about St. Andrew in particular? GEORGE: If you had told me a year ago that I would be writing a book on St. Andrew, I would have said you were crazy. I never imagined that I would do such a thing. But when I had some serious problems, I went to New Valaamo Monastery in Finland where I was given the extremely kind hospitality of the monks and Igumen Sergei. It was like entering the doors of paradise. You can imagine; it was cold, quiet, silent, and the only things I had to face were God, nature, and myself. At the time I wanted to write a book about the Kalash, the descendants of Alexander the Great on the northwest border of Pakistan, who are still pagan. Their religion is still very connected with ancient Greek paganism, and I feel an urgency to preserve their mythology and legends because this is an endangered culture and there are only two thousand of them left. I am fascinated by what I call “The Cross of the North.” This is a geographical cross that you can trace on a map. The vertical bar links the far north of Russia to Greek Orthodoxy in the south. The crossbar connects Finnish, Russian and American Orthodoxy, from Sts. Sergius and Herman of Valaam, through the deserts of the “Northern Thebaid” to St. Herman of Alaska on Spruce Island. I was thrilled to be at Valaamo, receiving the tradition of Valaam Monastery and writing about the saints. The abbot helped us very much. My wife is Ukrainian, a Russian national, and we were given access to the monastery archives and allowed to copy anything we liked. This was a very great gift of God and of Valaamo. We translated from many books and then came back to Greece to begin writing. 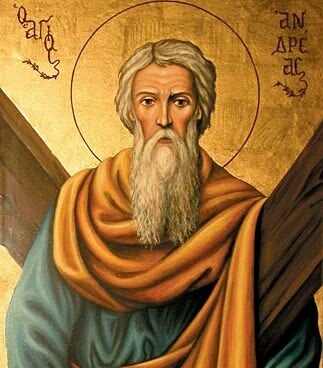 Even then I knew that I must begin by writing the life of St. Andrew the Apostle. RTE: The tradition that St. Andrew was in Karelia is still held today? GEORGE: Yes, by the monks of Old Valaam Monastery in Russia, some monks of New Valaamo in Finland, and by Finnish and Russian Karelians as well. St. Andrew is at the center of the icon, “Synaxis of All the Saints of Valaam” at New Valaamo Monastery. As I began to write, I found myself coming across more and more scattered information about St. Andrew from all over the world. Finally, my Greek editor, Sophia Oriphanidou, said, “Wait on the lives of the saints of Karelia, write first about St. Andrew himself.” I didn’t feel right working on a book about an apostle, but I told myself, “Yes, I’m a very bad guy, but it happens that I have to write this book, so I will.” It was an inner obligation that I knew I couldn’t avoid. I’m not worthy to write about him, but I had to, and I ask everyone to forgive me. Once I began, many sources came to me and people came forward to help, from northern Russia, central Asia, eastern Europe, Ethiopia – texts and oral traditions, even from the Kalash people of Pakistan, whom I mentioned earlier. Their texts speak of the presence of a messenger from God by the name of Indrein, and I cite this tradition in my book in their local language, because in the old Romanian, St. Andrew is called Indrean. I collected many local traditions, everything I could find. At first it was very difficult, but then things began coming. RTE: You said earlier that it was as if they were being put in your way. GEORGE: Yes, but at the beginning it was chaos, just scattered information from around the world. Also, I knew that I didn’t want to make traditions out of legends. I just wanted to follow the sources and see where they led; it was like putting a huge puzzle together. RTE: What languages did you work in? GEORGE: The oral traditions and texts referring to St Andrew are in ancient Greek, modern Greek, Pontian and Calabrian Greek, Georgian, Abhazian, Slavonic, Serbian, Russian, Ukrainian, Romanian, Kalasha, Baganda, Kurdish, Ethiopian Geez, Ethiopian Amharic, Coptic, Arabic, Aramaic Syrian, Turkish, Turcik of Central Asia, Iranian, Bulgarian, old English, English, German, Italian, Latin, Albanian, Finnish, Karelian, Armenian, and many dialects. I also had to deal with many languages, scripts and dialects, living and extinct, that didn’t deal directly with St. Andrew, because I had to read the sources concerning the world in which he lived. These were in Hebrew, Samaritan, Bantu, Kushitic, Teso, San, Tokharian, Sanskrit, Chinese, Mongolian, Korean, Amazigh-Berberic, Gothic, Gaelic, Saami-Lappish, Swedish, Norwegian, Polish, Tadjik, Sogdian, and so on. Of course, I wasn’t able to learn all these languages, but I was fortunate enough to find native speakers and scholars around the world to help me with these sources. And here I have to thank my wife and spiritual sister Olga, because her help with the Slavic sources was fundamental for my research. Megas Farantos, the well-known professor of dogmatic theology in Greece and Germany, who represents the Ecumenical Patriarchate and the Greek Church in dialogue with the Roman Catholics and other religions, was a great help to me. He trusts my work and academically supports me. He told me, “Don’t critique the traditions, this is not your job. Accept them or don’t accept them, but don’t critique them.” Secondly, he said, “Adopt a principle of working. They can fight your interpretation, but not your principle.” So, I took as a principle the premise that, “I accept all evidence as possible, whether it is a writing of the Holy Fathers, an oral tradition from Uzbekistan, a Coptic text from Ethiopia, a simple dream, or the archeological excavations of a Chinese scholar.” It is impossible from our time to absolutely say that a certain isolated tradition is true or false. My idea was to work from another direction by putting down all the scattered sources to see if the different tra- ditions of St. Andrew’s journeys fit together geographically and time-wise. I wanted to see if they were even possible. Then, once I exposed the contradic- tions, perhaps I could find the actual routes of St. Andrew’s journeys. The question was if, by setting the various traditions side-by-side, I could trace St. Andrew’s travels with any probability. Our strongest evidence, and what we always hoped for, was early written commentary about the apostle’s visit to an area along with a separate, verified oral tradition from the same place that has been passed down until now. As I went on, I discovered that in time and geography the Kazakhstani tradition fit the Sogdiana tradition (modern Uzbekistan), the Sogdiana tradition fit into the Parthian tradition the Syriac tradition. It was like a train, one car after another, until I had only twenty years missing from St. Andrew’s return to the Black Sea from Valaamo until he went to Sinope – and from there to Patras in Achaia, to his martyrdom. RTE: Were you able to resolve those twenty years? GEORGE: Yes, I found a local Romanian tradition that St. Andrew lived twen- ty years in a cave in Romania, in Dervent, and during this time he traveled through what is now Romania, Bulgaria and Moldavia. But the most incredible thing was that, according to the early Romanian traditions, the years he was there was the exact period I was missing from the other traditions. The most important thing is that these puzzle pieces – the separate local traditions of Bulgaria, Romania, Ethiopia, of the Aramaic people, the Syrians, the Copts, even the Greek and Roman church traditions all fit together, but you have to follow them step by step to recreate his life. Finally, I had only one piece that I couldn’t fit, even as a possibility: the Declaration of Arbroath, the fourteenth-century Scottish declaration of independence from England which says that the Scots were taught the Christian faith by St. Andrew himself. Historians dismiss this, but I have to point out that his presence there was not physically impossible. RTE: And who signed this declaration? GEORGE: The nobles of the Scottish nation, in 1320. The Arbroath tradition is interesting because there is no other written claim of St. Andrew in any place in Scotland, although there are a few scattered legends that say he was in Scotland generally. The most common tradition says that St. Rule (or Regulus), who was possibly a Greek monk from Patras, brought some relics of St. Andrew from Patras to St. Andrew’s in Scotland in the fourth century. St. Andrew is the patron saint of Scotland, and that the relics were there is undisputed. They disappeared from the cathedral only during the Calvinist Reformation destruction. There is a second tradition that says they were brought by an eighth-century abbot, but according to the nobles of the Scottish nation, St. Andrew was actually there, and I wanted to finish my book by simply seeing whether this was possible or not. For a long time, it didn’t seem that there were any traveled routes connecting this place in Scotland to other places St. Andrew is known to have been, until I learned of a group of Lapps called “the Seal People.” These were seal fishermen who lived on the Baltic coast in an area St. Andrew is known to have been. They traded by sea from Scandinavia to the Hebrides, the Orkney and Shetland Islands, and to northern Scotland – a place now called St. Andrew’s, where the relics lay for centuries. In the first century, Rome had already captured southern Britain, and the Scots and Picts further north were very hard-pressed. 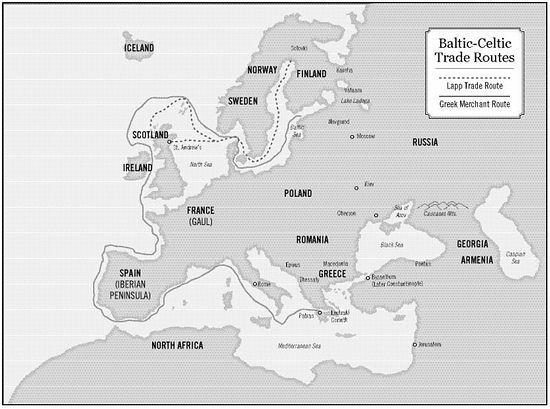 When trade in the south was closed to them, they began to use this old Celtic-Lapp route over Norway, Denmark and Sweden. The ancient Greeks had already mapped this road, and Pithias of Marseilles went to these places about 330 B.C., and probably to Iceland and Greenland as well. I can’t say that St. Andrew traveled with the Lapps, of course, but this route did exist, and if he did go to Scotland it would have to have been after his visit to the Baltic Sea and before Romania. the (then) Greek cities of Marseilles, Nice, Antibes and the area of Monaco, and then to Rome, Sicily, and Greece. This is why the ancient Slavic sources recount that St. Andrew left Russia for Rome. In fact, I don’t believe he ever got to Rome, because if he had this would surely have been recounted in the Latin tradition. For reasons that I go into in my book, I think that he returned to the Germanic lands where the Romans had created a new road connecting the Baltic with the Danube. From the Danube he could have sailed down to Dobrogea in Romania. RTE: Would it also have been possible that some of the tribes he encountered in eastern Europe might have migrated to, or traded in, Scotland and that this was the origin of the tradition? GEORGE: Yes, there are some theories that the Scot aristocracy were descendants of the Verangian Russ or the Scythians, but I’m doubtful about this. In the Declaration of Arbroath the nobles are talking about St. Andrew being in Scotland. That was their statement. RTE: How do modern Scottish Christians see this? The Tower of St. Regulus, Scotland. GEORGE: They believe that the Arbroath tradition was based on St. Regulus’ bringing the relics from Patras in the fourth century (or an abbot in the eighth), but I’m still open to the possibility that there is something older at work. The Declaration of Abroath is very important and from a time when people were careful of oral tradition. I would be surprised if they so quickly mixed up the tradition of his presence with that of his relics. Unfortunately, there is no collaborating evidence that he was there, so I can’t say it was even probable, just possible. RTE: How could he have traveled so freely among these vastly different peoples? GEORGE: He was a humble, simple man, and for a simple man nothing is impossible. If he had been an arrogant European explorer he would never have trusted these people, he would have found his own way like Pitheas, who made a boat and sailed to Greenland from Marseilles. Although he respected their knowledge, Pitheas didn’t fully trust the locals because he was a Greek and they were barbarians. You see, my book is a cultural tapestry. It includes the Scythians, the ancient Scots, early Africa. It is about St. Andrew, but it is also about the world he moved in: the Slavs, the Pharisees, Epicureans, Stoics, the North Africans, the Lapp nomads, the Han Dynasty in China, the Mongols and the Turks. My editor told me, “Don’t just write the life of St. Andrew, describe the places he went and the people he would have met.” When I began writing about these places, I found that I had to depict the whole era – how Siberia and Finnish- Russian Karelia are connected to central Asia, Africa and Scotland – so that a reader can understand what the world was like at that time. Tertullian, An Answer to the Jews, Chapter. 7, Ante-Nicene Fathers, Vol. 3, p. 157-8. T&T Clark, translated by S. Thelwall. to ask permission to quote ARTICLES ESP. St Andrew for an Ebook with Amazon Kindle on the Saints.